Hunters may have been exposed to the truth of the World of DaknessÃƒâ€šÂ© - that monsters exist - but they actually learn very little about what stalks the night. Every hunter must answer the call in his own way, according to his own values and beliefs. What other choice does he have? But what if a radically different outlook made the hunt a radically different reality? What if you could make the hunt your own? In the Cradle of Civilization? 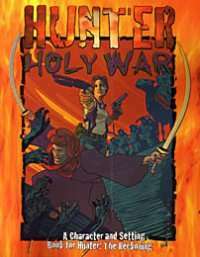 Hunter: Holy War invites you to travel to the Fertile Crescent - the Middle East and Egypt - to discover what beasts lurk even under the desert sun. Whether your hunter travels to this foreign land or is the desert's son, learn how different cultures answer the call - and how their hunt is different from that of the West. Discover how you can define the hunt.